Perhaps it was a cue for congressional Republicans to take the reins in the shutdown negotiations. 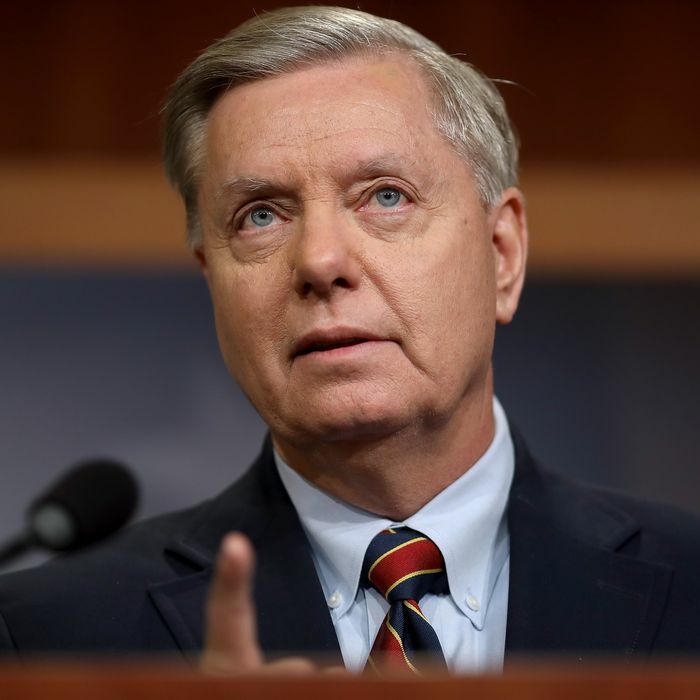 According to CNN, just after Trump’s abrupt departure, GOP senators — including Lindsey Graham, Lisa Murkowski, and Susan Collins — met in Graham’s office to discuss a path out of the second longest shutdown in U.S. history. The crew discussed a deal that would include Trump’s preferred $5.7 billion for the border wall, with a heap of policies that would encourage Democrats to sign on to get to the 60 votes needed, including the preservation of DACA, a change to H2B visas, and a boost to the Temporary Protected Status program, which allows nationals from crisis-affected countries to work and live in the United States for up to 18 months. The group of senators then sent the idea to Trump adviser Jared Kushner, who believed that if he presented a plan that included the wall money that could pass in the Senate, his father-in-law would consider the deal. And according to NBC News, the president seemed amenable to putting DACA in the negotiating mix. For reform-minded Democrats, there are worse ways out of the shutdown than trading cash for a wall that could take ten years to build for the expansion of DACA and TPS. DACA alone covers up to 800,000 recipients, and the Trump administration has already attempted a repeal that was blocked in the United States District Court in D.C. But the Temporary Protected Status program would mean a larger victory for those who wish to protect migrants fleeing political and climate crises. As part of the Immigration Act of 1990, TPS allows the attorney general to grant protected status to at-risk nationals who migrate to the United States because of “extraordinary and temporary conditions.” The program first granted temporary sanctuary to Salvadorans fleeing a civil war in which the U.S. military trained a battalion that killed some 1,200 men, women, and children. In January 2018, the Trump administration announced that TPS would expire in September 2019 for some 263,280 Salvadorans living in the United States, a decision that would represent a major economic — in addition to a humanitarian — failure. According to a 2017 study by the Immigrant Legal Resource Center, removing TPS-protected Salvadorans, Haitians, and Hondurans would decrease the GDP by $45.2 billion and cost $3.1 billion in deportation costs over the next decade. Some rank-and-file Republicans also appear to be ready for a deal, with or without the border: On Wednesday, eight GOP congressmen — including Texas representative Will Hurd — voted with Democrats to pass an end to the shutdown. President Trump reportedly isn’t thrilled about his trip to McAllen, Texas on Thursday. “It’s not going to change a damn thing, but I’m still doing it,” he said in an off-the-record lunch on Tuesday. If the president is uninspired by what is soon to become the longest shutdown in U.S. history, the reform-for-wall deal could be an easy out, with no emergency powers necessary. That is, unless the administration’s senior nativist and architect of Trump’s Tuesday night speech, Stephen Miller, has anything to do with it.